good evening, fine folks. pardon my absence (again) and (again). lots of life going on right now. big things. exciting things. stressful things. i miss my blog. i miss sharing my story. i’ve got to catch you up on the wedding, the new house, dealing with my anxiety, etc. but for tonight, a love story of a girl and her pup. [b] is traveling abroad for the next couple of weeks. (have i mentioned before that he has a blog, too? check it out here) which really bums me out. he’s my other half. my source of strength. my reminder that things will be ok. which i’ve needed a lot lately. thanks to the wonders of technology and FaceTime, i get to communicate with him quite a bit, which makes it easier. but what helps even more is having starksthepup. he’s my baby and my favorite non-human. i love him more than i ever could have imagined. even at the times when he’s being a lunatic; like when he runs through the screen door, or won’t stop pacing around, and when we go for a walk and he has to stop and either smell or pee on EVERYTHING, or when he does that high pitch whining noise in the car… even with all those things he makes my heart full every day. every morning when i wake up he is snuggling right next to me (sometimes with his face IN my face – that’s precious) and when i come home from work he is thrilled just to see me. and wants nothing more than to have his belly rubbed and play ball. and eat treats, too of course. tonight we went on a 2 mile run (more like a jog, let’s be honest) and came back home and played ball in the backyard for almost an hour. and for that hour i wasn’t thinking about anything, or worried about anything, or sad about anything, or anxious about anything. i was happy. that pup is my baby. and he’s the cutest, smartest, more adorable pup you ever did meet. thanks for being there for me, pup, physically at least – because seriously you make the worst guard dog ever. thank goodness you’re cute. so how bout this weather? forecast for today looks incredible if you solely look at temperature. if you look at the radar and details it looks much less appealing. storms. thunder. hail. tornadoes. rain. starksthepup will not be pleased. we do need the rain, but i just hope this weather cleans up its attitude before birthday weekend commences tomorrow. i had a post that i was hoping to have ready today, well actually yesterday. but the creative blogging bug has not been my friend. if only i could translate all the thoughts in my head to here and they sounded the way i wanted and my pictures could magically be edited, that would be like ideal. alas, a short post is on the docket for today. and also an unlikely one seeing as i am not at all an ootd (outfit of the day) type of gal; i follow way too many fashion bloggers who look flawless in all their posts to dare put myself out there. i’ve never been one to be able to put together outfits well. so when i finally feel like i put one together, i kind of want to just wear it everyday. i need to connect with some fashion blogger friends and have them help this ‘unfashionista’ out. ive been working on getting over what people might think, and stop caring so much about comparing myself to others; so – here’s my look on this stormy thursday. my favorite part is hands down my new Minnesota necklace from a local shop in my hometown (Brick Girls Loft). hands down one of my favorite places to acquire new and fun jewelry. yesterday felt like friday which means today was supposed to be saturday. but things didn’t exactly work out that way. [lamesauce] in other news, spring has ((finally)) arrived here in the wonderful state of minnesota. it was just a few short weeks ago i was writing about our plentiful snow fall; and even last week there was snow while i was exploring the lands of canada. but i do believe that spring has arrived and it is here to stay. (i hope) which aside from the fact that my allergies are annoying, means only good things. sunshine, long walks with the pup, ((my birthday)), reading on the deck, running outside, flip flops, driving with the windows down, eating on patios. all fun things. 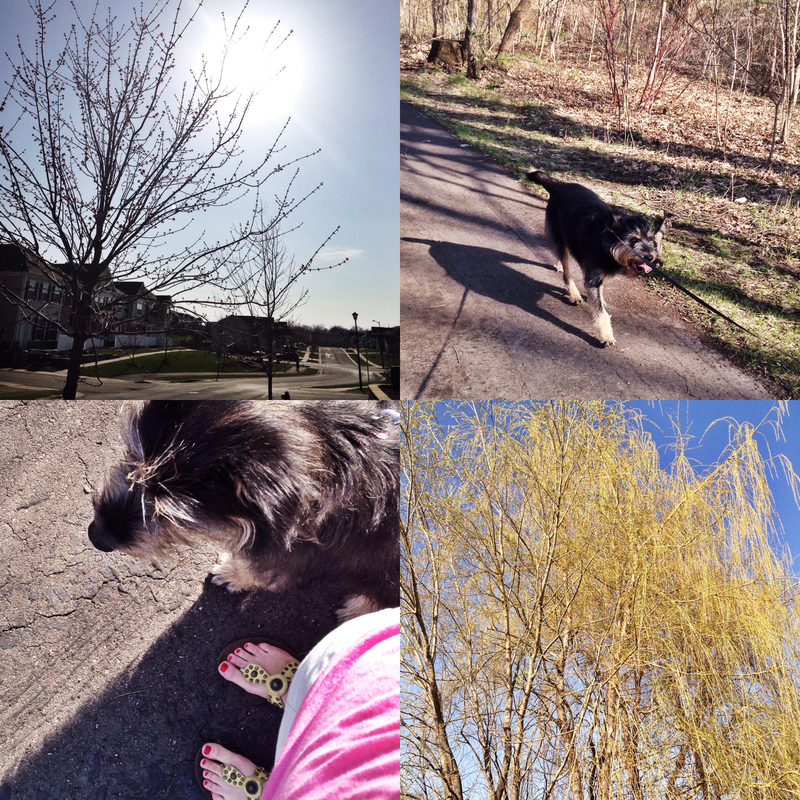 seeing as it was gorgeous out yesterday B and i went on a nice long walk with starksthepup. it was made a little extra long by the fact that i needed to get some more steps in to ensure i would reach 10,000 (which i did). looking forward to reinstating that little activity after work most days now, especially because i am done traveling until june. believe it or not, starksthepup certainly doesn’t believe it, but i am most pleased with getting back into a routine and spending time with my boys.